Tinker Tailor Soldier Spy is a film that, on a purely technical level, is hard to fault. It's beautifully shot by Tomas Alfredson, who previously directed the superb Let The Right One In, well acted by a rogue's gallery of great British acting talent and it has a wonderful sense of time and place to it. Alfredson and his crew capture a decaying Britain that is slowly suffocating under the weight of the Cold War and its own sense of increasing obsolescence. Much like the John le Carré novel upon which it is based, the film really conveys a sense that the spies and intelligence agents that populate it have seen better days and are now going through the motions, no longer certain that the war they are fighting is really worth a damn anymore. It's a Cold War thriller that is appropriately chilly. Whilst this cold, distant approach is a great strength of the film, since it matches le Carré's fiction in depicting espionage in as realistic and dispassionate a manner as possible (reflecting his own experiences working for MI5 and MI6, but also contrasting with the sensationalism of the James Bond series) it is also an obstacle that it never fully overcomes. The story hardly wants for excitement and drama; George Smiley (Gary Oldman), a former spymaster who was unduly ousted from The Circus (le Carré's nickname for MI6) alongside his mentor, Control (John Hurt), is drawn back to lead the search for a Soviet mole who is believed to have reached the upper echelons of the service and has been using that position to feed information to the KGB, represented by an enigmatic operative known only as Karla. For fear of alerting the mole, Smiley is forced to work in secret outside of the Circus whilst his confidant Peter Guillam (Benedict Cumberbatch) acts as his eyes and ears within it. That's a terrific premise for a film and it could make for a brilliant piece of intelligent entertainment. In fact it already did make for a brilliant piece of intelligent entertainment when the BBC adapted the novel for television in 1979 with Alec Guinness as Smiley. Where the film falls down in comparison to its illustrious forbear is in its characterisation, which is a direct result of the cold, distant approach that Alfredson adopts. Both the TV series and the novel go to great lengths to establish who the possible suspects (here played by David Dencik, Colin Firth, Ciarán Hinds and Toby Jones) are and how they relate to Smiley. There's an obvious darkness to the story because any one of these men could be a traitor who has the fate of hundreds of agents in his hands, but there's also a warmth to it; you get a sense of the men at both their best and their worst, making it easy to see why Smiley would have such a hard time picking out the correct one. Alfredson's approach is so emotionally removed from the story that it's hard to get a sense of who any of the suspects are so it's hard to get invested in the investigation. When the mole is revealed there isn't a sense of surprise or shock, but grudging acceptance; the plot dictates that there has to be a mole, it might as well be the person that it is, even though that seems to have little bearing on anything else that happens. The other major problem with the film is its pacing. In trying to condense le Carré's hefty tome into just over two hours, screenwriters Bridget O'Connor and Peter Straughan cut the investigation aspect of the story to the bone, essentially removing any opportunities for red herrings, dead ends or the steady collection of evidence. Or, to put it another way, the very basic components of an investigation. There's drive to the film but no sense of direction, or of building to a climax, and there is an acute sense throughout that had the film been closer to three hours long, and had had the time to really delve into the details of the investigation and establish how difficult it is for Smiley to reach the truth, it would have been a more engrossing experience. Whilst its slightly calculating air renders the film largely unemotional, it isn't completely, thanks largely to the work of Benedict Cumberbatch as Guillam (as well as Tom Hardy as Ricki Tarr, a young, impetuous agent who plays a small but crucial role by bringing the existence of the mole to the government's attention). As the man who has to sneak around the Circus gathering evidence for Smiley and facing down the accusations and stares of the people he is investigating, Guillam is the most emotionally vulnerable and open person in a story full of characters who keep their cards close to their chest, and Cumberbatch does a very good job of conveying the damage that Guillam's role has on his personal life - particular in a scene in which he has to end a relationship for fear that it may provide his enemies with leverage against him - and is very much the emotional centre of the film, especially when contrasted against the quiet calm of George Smiley. As Tom Hanks and Ewan McGregor demonstrated (the latter on three separate occasions), stepping into a role previously held by Alec Guinness is no easy task, and whilst he lacks the avuncular qualities that made Guinness' Smiley so appealing, Gary Oldman absolutely nails the cold efficiency of the character. 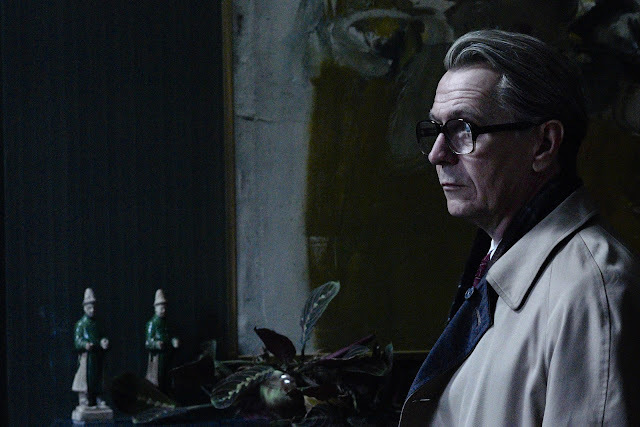 Oldman has made his reputation as an incredibly physical performer, so there is a great thrill in seeing him take on a character who is almost static much of the time. Smiley is a consummate spy because he never lets anything slip, except where his (unseen and promiscuous) wife is concerned, and in his best moments Oldman puts across this sense of Smiley as a ruthless professional who is also intensely sad. It's all there in his hangdog expression, though Smiley would be the last person to admit it. As efficient and cold as its central character, Tinker Tailor Soldier Spy is a film to be admired, if not exactly loved. The craft behind it is exemplary, and the flashes of emotion and heart that are allowed to seep through are affecting, but it's ultimately a cold, hard examination of cold, hard men fighting for a cause they no longer believe in, in a world that is slowly crumbling around them. Needless to say, there are no gadgets or parkour sequences in sight.